Extract-Transform-Load (ETL) is still a widely-used pattern to move data between different systems via batch processing. Due to its challenges in today’s world where real time is the new standard, an Enterprise Service Bus (ESB) is used in many enterprises as integration backbone between any kind of microservice, legacy application or cloud service to move data via SOAP / REST Web Services or other technologies. Stream Processing is often added as its own component in the enterprise architecture for correlation of different events to implement contextual rules and stateful analytics. Using all these components introduces challenges and complexities in development and operations. This session discusses how teams in different industries solve these challenges by building a native event streaming platform from the ground up instead of using ETL and ESB tools in their architecture. This allows to build and deploy independent, mission-critical streaming real time application and microservices. The architecture leverages distributed processing and fault-tolerance with fast failover, no-downtime, rolling deployments and the ability to reprocess events, so you can recalculate output when your code changes. 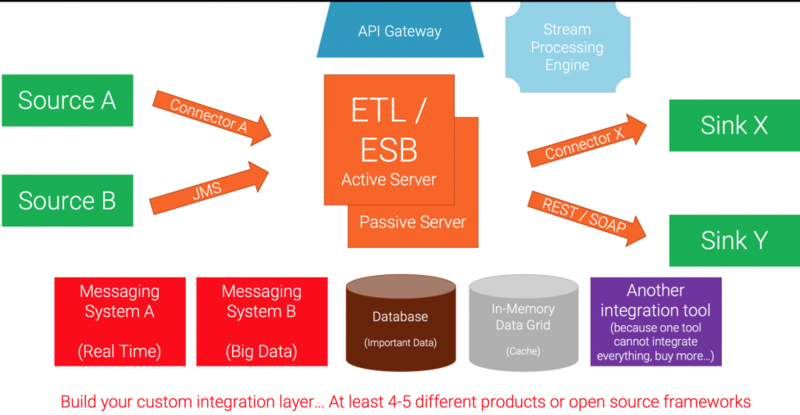 Integration and Stream Processing are still key functionality but can be realized in real time natively instead of using additional ETL, ESB or Stream Processing tools. A concrete example architecture shows how to build a complete streaming platform leveraging the widely-adopted open source framework Apache Kafka to build a mission-critical, scalable, highly performant streaming platform. 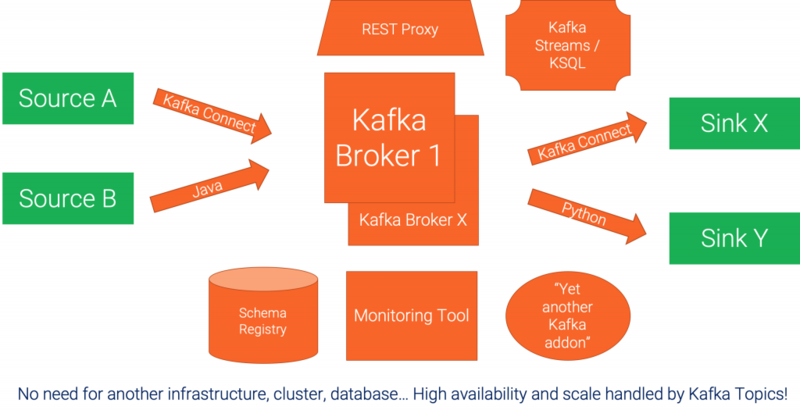 Messaging, integration and stream processing are all build on top of the same strong foundation of Kafka; deployed on premise, in the cloud or in hybrid environments. In addition, the open source Confluent projects, based on top of Apache Kafka, adds additional features like a Schema Registry, additional clients for programming languages like Go or C, or many pre-built connectors for various technologies. Video Recording: Kafka vs. MQ / ETL / ESB – Friends, Enemies or Frenemies? 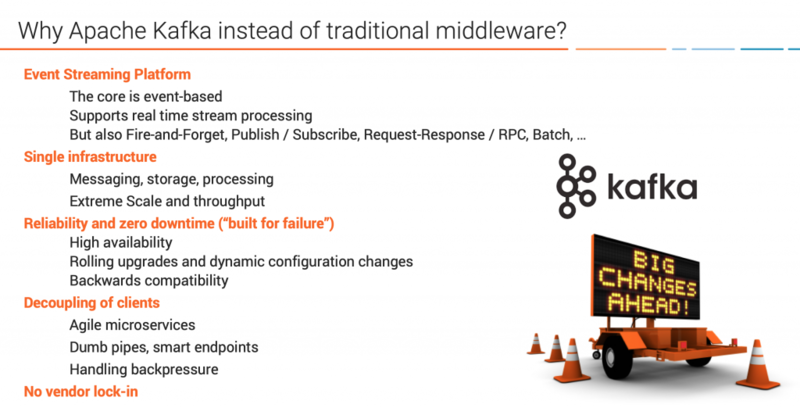 Why Apache Kafka instead of Traditional Middleware? Please share your thoughts, too! Does your infrastructure see similar architectures? Do you face similar challenges? Do you like the concepts behind an Event Streaming Platform (aka Apache Kafka)? How do you combine legacy middleware with Kafka? What’s your strategy to integrate the modern and the old (technology) world? Is Kafka part of that architecture? Please let me know either via a comment or via LinkedIn, Twitter, email, etc. I am curious about other opinions and experiences (and people who disagree with my presentation). This entry was posted	on Thursday, March 7th, 2019 at 17:45	and is filed under Apache Kafka, Big Data, Confluent, EAI, ESB, In Memory, Integration, Kafka Connect, Kafka Streams, KSQL, Messaging, Microservices, Middleware, Open Source, SOA, Stream Processing. You can follow any responses to this entry through the RSS 2.0 feed. You can leave a response, or trackback from your own site. Powered by WordPress v 5.1.1. Page in 0.268 seconds.